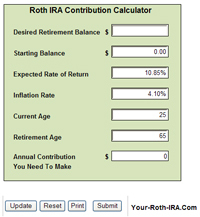 Below, you'll find links to the best Roth IRA calculators on the web. Some of these calculators are on our site and some of them are found on other sites (the hosting site is identified with each featured calculator). 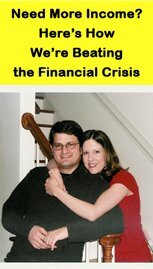 Keep in mind that financial calculators are only beneficial as a general guide, not as an authoritative source. Any number of variables will impact your financial plan and your specific Roth IRA investment strategy. However, these calculators do provide you with ballpark estimates for any number of questions, such as the annual contribution you need to make to achieve your retirement goals. 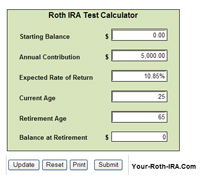 As a result, these Roth IRA calculators can be of great benefit. The calculators below will assist you in determing the parameters of your savings plan. How much do I need to contribute on an annual basis? What annual compound rate of return do I need to generate? How much of an added benefit will an extra year of contributions provide? As you input these variables, the calculator automatically updates your retirement balance, providing you with insight on where you're headed if you continue down your current path. 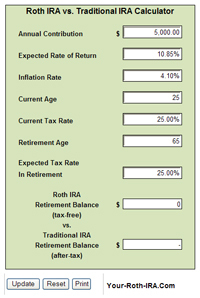 Hit "Calculate," and it generates a graph, providing you with a visual representation of your future Roth IRA savings. You can also enter your expected marginal tax rate, and the calculator will show you the projected value of the same amount of money invested outside of your Roth IRA. This provides you with a clear illustration of the tremendous benefits of a Roth IRA versus non-tax exempt alternatives. This calculator offers many of the same benefits. However, it also offers a few more variables. For instance, you can input your expected rate of return prior to retirement as well as after retirement. You can also input an expected rate of inflation as well as your current income tax bracket and expected income tax bracket in retirement. 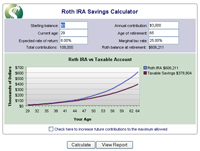 Hit "Calculate," and it provides you with graphs and charts outlining your expected results for a Roth IRA, a Traditional IRA, and a regular taxable savings account. Again, this should provide a clear, visual illustration of the immense benefits of investing your retirement savings in a Roth IRA. As you input these variables, the calculator automatically updates, letting you know how much you need to contribution to your Roth IRA on an annual basis in order to meet your retirement goals. The Roth IRA calculators listed below offer many of the same functions as those above, while specifically focusing on what's best for your individual financial situation - a Traditional IRA or a Roth IRA. 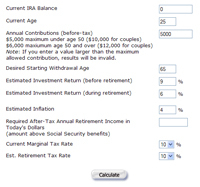 As you input these variables, the calculator automatically updates, letting you know the value of your retirement savings under two different scenarios - one if you invested all your contributions in a Roth IRA and the other if you invested all your contributions in a Traditional IRA. 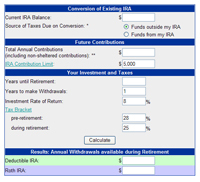 Hit "Calculate," and it provides you with an after-tax dollar figure you can expect to withdraw from either a Roth IRA or a traditional IRA. However, keep in mind that future tax rates are difficult to predict, making it very tricky to accurately forecast your returns on a Traditional IRA which is taxable upon withdrawal.